EVERY SUMMER IT’S THE SAME. The heat arrives, hundreds of Herbón peppers begin to enter through the door. A thrill, a joy, food that I could eat all day long. But friends, having half of the family in Arnoia is hard. Because nice weather arrives and kilos of Arnoia peppers begin to enter through the door. Stressful, exhausting, a bellyful. But doing something you enjoy is never a chore. Sure, one pepper rather than another, but that is the joy of the pepper life. The heat arrives and it is the struggle of the peppers, spending two months eating one variety or another for each meal because you can not give up peppers. They are the best. I care a lot about peppers. You should care about them. Choose one pepper and stick with it.
. . . others aren’t (Photo via The Oregonian). First of all. They are Herbón peppers. Not Padrón. That is clear thing. And brilliant green peppers, the first characteristic to distinguish them. Another, smooth and thin skin. And one more. Maximum size: five centimeters, according to José Ramón Torreira, president of the Herbón Pepper Denomination of Origin and global expert of the best known Galician peppers. Are they spicy? It is inevitable that one slips through, because friends, Hebrón peppers are relatives of the Mexican chile, so they tell me. But the joke is this: you never know what is going to happen. And note, here is an important piece of information that has resolved a generational debate in my family: fry them without the stem. And the best way to get one without puncturing the pepper? A teaspoon. Or at best a blunt knife. Now you know, Herbón forever. Without th stem. And if one is spicy—even though they are picked by the expert hands of pepper farmers—enjoy it. It is the law of the pepper. Next stop: Arnoia. The Ourense locality boasts about their peppers. Very large, between seven and eleven centimeters. And it is normal to eat them fried. The person here that knows is Rodrigo Aparicio, from the regulatory council. Take note: hot oil but not too hot and above all don’t rush them; they practically boil. Though of course, now that the Arnoia pepper is all the rage, they also appear in Spanish omelette and even as stuffed. But delicious, delicious fried. And the skin, don’t worry. In June and July, as fine as it is, it is not necessary to remove the skin. From time to time . . . well the skill of a knife helps. If Herbón peppers are sold by hundreds—€6.00 at the beginning of the season and from €1.50 during peak season—peppers from Arnoia go for kilos. Between €3 to €1.50, depending on the moment when you indulge in peppers. And residents of Ourense are not spared from the spicy emotion “some can be hot and give a scare” because there are cross-breeds. Of course now they are working to find the most authentic seed of a variety that has always been from Arnoia. 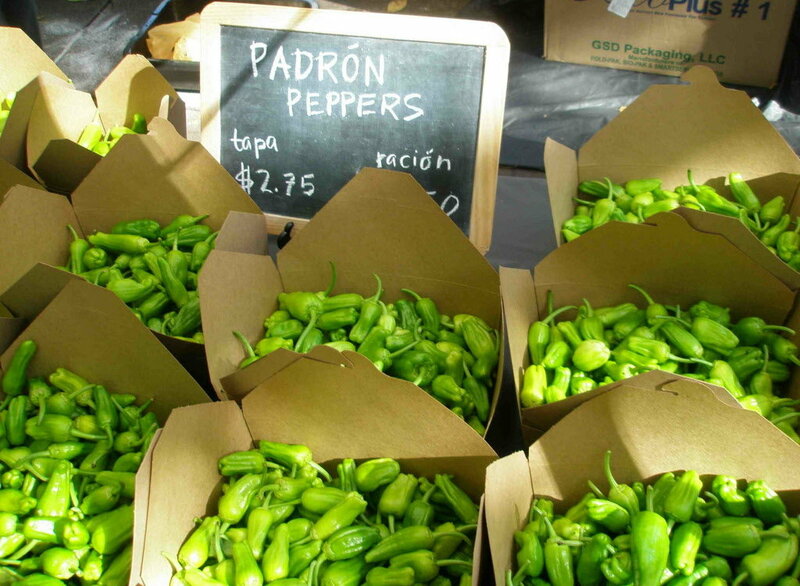 And finally, peppers from Couto are the kings of the north. Native to Narón, friends, these are not spicy. For the least daring, a relief. Because these do not have capsaicin, which is what gives life to Herbón peppers—and has medicinal applications—so there is no need to jeopardize the integrity of our mouth. If Herbón peppers are named after the monastery where they were born, grew, and multiplied, peppers from O Couto are no different. In order to tell them apart, you only need to pay attention to their color, which must be dark green. It also has little shine and a length between four and eight centimeters. And that they are not spicy. Not one. That is why, the regulatory council explains, they are highly regarded in the hotel industry. Not everyone is prepared for the adventure of Herbón peppers. Now you know. Choose a pepper. Or not. Give in to all of them. Me, it’s that I have to go. I still have half a bag of Arnoia peppers and almost a hundred of Herbón peppers. And today I still do now know which ones it will be . . .